Welcome to your first year in the School of Nursing and Midwifery at the University of Plymouth. 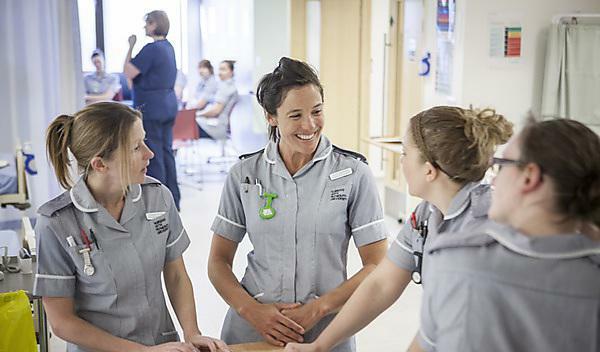 You are starting on a fascinating intellectual and professional journey and you will need to stay focused and work hard, but should also aim to enjoy your studies and make the most of your time as a member of the School of Nursing and Midwifery and the University. You will see from the timetable below that Induction week will give you the chance to find out more about the nursing course and to meet staff and fellow students. You will also become familiar with the University both its campus and the services available to support you. There are so many opportunities for you to engage with, which will add to your experience and help you grow both academically and personally. On behalf of the staff and students, I welcome you to the University of Plymouth and look forward to meeting you. Message from Louise Winfield, Interim Head of School of Nursing and Midwifery. The forms below are based on the University's open learning platform. You will be asked to create an account to enable you to complete the forms. Any documents requested by the admissions team. Provision of the documents requested below will enable you to complete your enrolment and collect your University card. Your University card enables you to access the University library and Students' Union. If your fees are paid by a sponsor, you will need to provide us with written confirmation of the agreement. Please bring this information with you. Tea and coffee will be available over lunch time. Please bring your own lunch, or buy it from one of the food outlets available. This is an opportunity to meet your fellow students from all fields of nursing and midwifery. Occupational health appointments will take place throughout the day. Please see separate information relating to these appointments. Occupational health appointments will take place throughout the day. Uniform fittings will also be taking place today for all adult nursing students. Please see the separate information for further information relating to venues and times for both of these activities. Your first module NRS403 Ways of Knowing starts on Monday 24 September 2018. Please make sure you have downloaded your timetable and know where you have to go. You will undertake a series of occupational health appointments over the next four months. It is important that you attend your designated occupational health appointment as this is a condition of attendance in placement areas. Your individual appointment date and time will be available during your first day at University. One of the rooms will be designated as a reception. Please report to the reception room in the first instance. When attending your first appointment please ensure you bring a record of any immunisations you may have had. Please also be aware your first inoculation may also take place at this appointment and it is important that you have had something to eat prior to this appointment. If you have a needle phobia please advise occupational health before you start via the email below. You will need to quote your name, date of birth and course in any email to Occupational Health. Future occupational health appointment dates and times will be forwarded to you via your University email account. The schedule of appointments will be posted on the programme moodle site for your information. Please only attend at the times scheduled to avoid long queues and disruption to users of the surrounding classrooms. Fittings for your uniform have been scheduled as shown above when you will have the opportunity to try on the tunic and trousers. Changing rooms will be available. Please ensure you attend the fitting at the specified time as the order for uniforms is based on your attendance and sizing. Your uniforms are scheduled to be delivered in November 2018.